Posted on March 1, 2011 March 9, 2011 by Pavel Y. 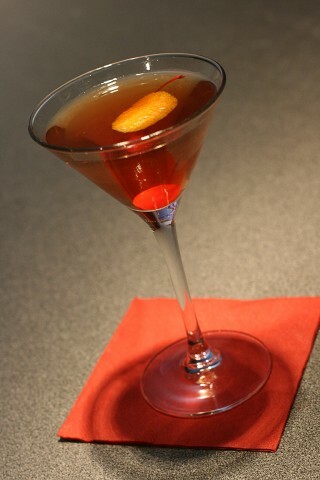 Today I want to toy with one of three classic variations of the Manhattan – the Perfect Manhattan. 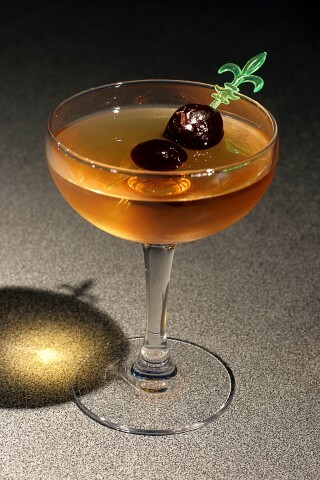 As we know, the Manhattan Cocktail has three well-known varieties – the Sweet Manhattan (basically a Manhattan. Actually, nobody names the Manhattan as the ‘Sweet’ Manhattan), the Dry Manhattan (with dry vermouth instead of sweet one) and the Perfect Manhattan. The pivotal point of the Perfect Manhattan lies in using an equal proportion of both vermouths instead of sweet vermouth. Incidentally, the name of the Perfect Manhattan seems open for debating and your approving depends upon preferable sweetness of the Manhattan. I have paid attention to today’s first cocktail at Cheri Loughlin’s Blog – The Intoxicologist. The concept of the Rat Pack Manhattan is to improve the Manhattan with a help of the legendary French liqueur – Grand Marnier. It sounds quite interesting. In average Ukrainian conditions we have only two or, well, three cut-and-dried vermouths for the regular mixing. Thus an idea to support my regular Cinzano with one of my favorite aged liqueurs attracted me at first sight. It had made my mouth water and I went to surf (unfortunately, Cheri’s recipe is quite inaccurate, she avoids bitters, but as we know, the Manhattan always contains bitters). The appropriate recipe was founded at the diffordsguide. The Rat Pack Manhattan sounds not quite delicious (or, frankly speaking, absolutely inedible). But really, rats have nothing to do with the Rat Pack Manhattan. Actually the Rat Pack was a group of American movie stars originally centered on Humphrey Bogart. The Rat Pack existed since 1950-s and in different time included among the partakers a number of famous actors and singers – Frank Sinatra, Dean Martin, Sammy Davis, Jr., Peter Lawford, and Joey Bishop. After the Bogart’s death the leader of the Rat Pack was Frank Sinatra (who was a notorious Dry Manhattan lover, by the way). The Rat Pack Manhattan was created in 2000 by Wayne Collins at High Holborn, London, England. Forsooth all members of Rat Pack (apart from Joey Bishop) were dead by that time. Probably Wayne liked the Rat Pack and named the cocktail after it. As Simon Difford supposes, originally Wayne used different whiskies to represent each of the Rat Pack crooners. The wash of Grand Marnier was for Sammy Davis, the wild card of the bunch. The Rat Pack Manhattan is a Perfect Manhattan with a little French twist. Coat a chilled cocktail glass with the liqueur and discard. Stir whiskey, vermouths and bitters with a lot of ice. Strain into the prepared glass and garnish with an orange twist and a maraschino cherry. Admittedly, I should say that it is simply the Perfect Manhattan with bourbon. The minor savor of an orange is barely noticeable. Thus it is so restrained variation of the Manhattan. Perfect. In a true English style, you know. More recently I decided to taste another Manhattan-like cocktail with Grand Marnier liqueur – the Boulevard (pretty often called as the Boulevard Manhattan). Actually the Boulevard Cocktail is rather similar to the Perfect Manhattan with Grand Marnier instead of sweet vermouth. I have found a recipe of the Boulevard Cocktail at the diffordsguide also. As Simon supposes the Boulevard is an old classic cocktail with an unclear origin. Stir all ingredients with a lot of ice. Strain into a chilled cocktail glass. Garnish with a twist of an orange peel (discarded) and two maraschino cherries. Crikey! The Boulevard is indeed a stunning cocktail! It’s like a harmonious jazz band of well-coordinated jazz stars. All ingredients – the whiskey, the vermouth, the liqueur and the bitters – play a perceptible role. The Boulevard Cocktail is a perfect citrus Manhattan. One of the most interesting things is an amazing play of two well-aged spirits – Grand Marnier and Makers Mark bourbon. The liqueur adds more noble notes of ageing to the bourbon. The notes of vanilla, candied fruits, especially orange, orange cake prevail in the nose and palate of the cocktail. The main palate of the cocktail is slightly dry with a lot of warm sweet savors. Undoubtedly, the Boulevard is an amazing cocktail though isn’t a Manhattan. The herbal part of the taste is so simple and too light as for the true Manhattan. 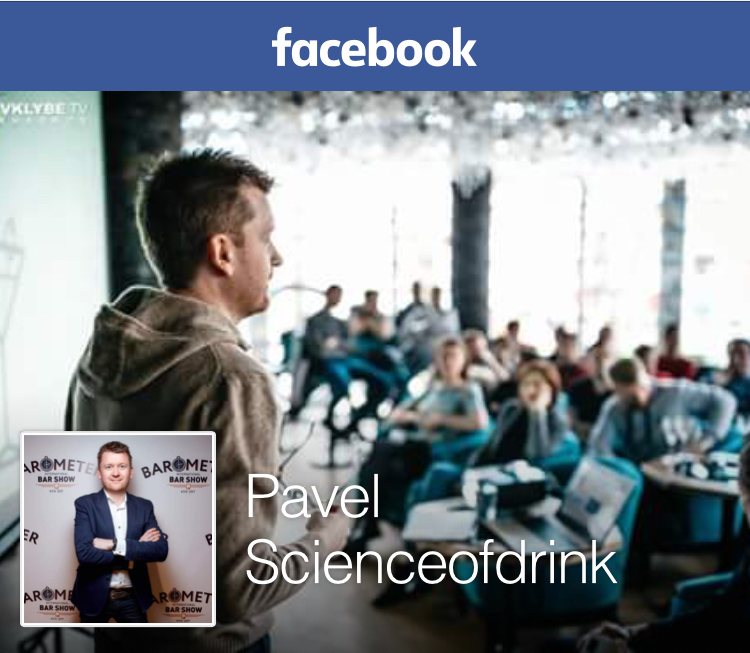 Бульвар определенно интересен. Минус банальный красный вермут, плюс хороший сухой вермут и Гран Марнье – это располагает. Коктейли с “монолитным” вкусом, кстати, иногда страдают недостатком глубины. Если, конечно, я правильно понимаю смысл термина “монолитный”. Чую что мой вариант, завтра сделаю точно. Вообще, пост написан из-за Булеварда. Однозначно. Первый коктейль – это не более чем неинвазивное обыгрывание, но и ему была отдана дань, так как именно он привел меня к Булеварду. В Булеварде всем советую обратить внимание на то, как поддерживают выдержанные ликеры выдержанные же спирты, это потрясающее явление. Actually a first edition (1862) of Jerry Thomase’s Bon-Vivant’s Companion didn’t note the Manhattan. A first mention of the Manhattan was in Harry Jonson’s Improved Bartender’s Manual (1882) or Byron’s The Modern Bartender’s Guide (1884), both sources are specified by some authors. A recipe of Manhattan Cocktail was noted in Bartender’s Guide by Jerry Thomas (1887) – the book was published after the Professor’s death. The recipe specify equal ratio between rye and vermouth with some bitters ad a dash of curacao or maraschino. Recipe noted by you is a modern variation and seems to be so interesting. Great post! that photo of the Boulevard is awesome, i also very much like that swizzle stick! Thanks Tiare! Actually I was inspired by the cocktail. The Boulevard is a stunning cocktail. And amarena kirschen work pretty well in it! The variation I posted is from Employees Only here in Manhattan. They make amazing drinks there. Their book, out at the end of last year, is great as well. It seems Speakeasy: The Employees Only Guide to Classic Cocktails Reimagined by Jason Kosmas and Dushan Zaric is quite an interesting book. So, It is in my wishlist now. Thanks for reminder!